Discover 4 ways to save time with warm introductions, buyer-focused selling, diversifying your contacts, and learning when to walk away. In sales, a great deal of success depends on knowing where to focus your efforts in order to achieve the highest return. While sales lore may suggest long hours and late-night calls, some sales pros are actually achieving better results in less time. How are they doing it? Making use of proven methods and social selling tools are a large part of their success. On top of that though, they know that sometimes the best approach includes knowing what not to do. Here are four huge time wasters for sales pros to avoid and alternatives to be more efficient and effective. In case you haven’t heard, cold calling is dead with only a three percent success rate. Reaching out to prospects without knowledge regarding their needs, preferences, or a warm introduction is ineffective for both parties. Thanks to social selling, sales teams no longer have to smile and dial hoping to hit the right person on the right day. Identifying relevant prospects can be much more strategic and efficient with the use of a tool likeLinkedIn’s Sales Navigator. It removes the guess-work regarding who you should reach out to and when, by delivering lead recommendations to you based on a defined set of criteria. Then, you can save preferred leads and follow updates of your prospects including job changes, news mentions, and new potential leads. Having information at your fingertips allows you to determine the best way to reach out to a prospect and with a highly-relevant message that proves you have done your research. Many sales professionals spend a great deal of time learning specs, benefits, and the best way to sell their product. They want to close a deal, and to do so they feel the need to focus on their product or service and the selling process. It’s true that you need to know what you are selling to add value, but where does the buyer fit in? The buyer has a process to follow as well. Failing to focus on their needs, timelines, and any deliverables they may owe their buying committee can be a mistake that costs you time and ultimately the sale. High performing sellers stay vigilant of the buyer’s needs and emotions and adjust accordingly. Understanding the rationale behind a buyer’s thinking is not easy, but it’s a skill worth refining. Not only does this increase your chances of closing the sale, but it also prevents you from spending time with buyer’s only to be eliminated for not tuning into and responding to their needs. This LinkedIn Sales Solutions post provides 10 key insights on buyer psychology that social sellers can use to view a sale from the mind of the buyer. A common misconception is to concentrate on maintaining a strong relationship with just one contact. After all, success requires devoting 100 percent of your time and attention to this person, right? In reality, devoting too much time to one person within a company is risky. People change positions and companies, and if the person that you invested all of your time into suddenly leaves, your relationship with the company can be at-risk. The practice of multi-threading into an account, or maintaining several contacts within the company, can eliminate the risk of being attached to only one contact. Developing relationships with several key people will also give you a broader perspective of their business needs and the decision-making process within the company. In the event that a main point of contact does leave, you aren’t scrambling to identify new contacts and spending time feverishly building new relationships. LinkedIn Sales Navigator allows you to perform advanced searches to find additional contacts within that company and see how to get connected to them, saving time and building a stronger network. When faced with a stalled-out buyer, the tendency for some salespeople is to work harder to force the sale to happen. But sometimes, no matter how artfully you present your case and strive to move toward a sale, you can’t gain any ground. When it becomes one step forward and two steps back, why keep investing your time? 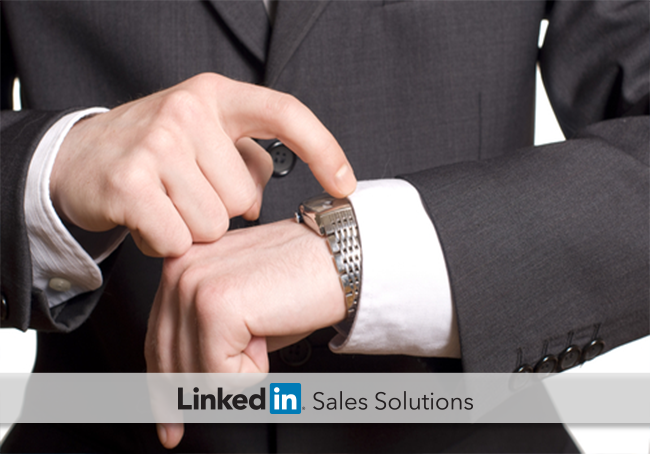 Seasoned sales pros know that certain sales opportunities hold little potential for success. This is not an easy task. No one wants to give up on a buyer; however you have to weigh the risk/reward against the amount of time you are spending trying to advance them in the buying cycle. It’s in your best interest to spend time with buyers that you can help and who are ready to take the next step. Now that you have four better ways to work and these social selling tips to increase your efficiency, time is on your side. Use these tactics to sell smarter and crush your quota!